Tis the season for warmer clothes. Many people seem to think that Copenhagen is in the frozen north, but the weather is really quite a lot like Scotland. It rarely snows here in the winter and although the temperature drops below zero, it's nothing northern Sweden. In the event of snow we have snow ploughs specially designed for our bike lanes so you can usually be assured that you'll get to work in the morning. And just because it's chilly doesn't mean you have to sacrifice your wardrobe. • WHO IS THIS PERSON? - LONDON - Tally Ho! •TAKE BACK THE BIKE CULTURE! ALL CONTENT IS COPYRIGHT CYCLE CHIC® 2006-2016. 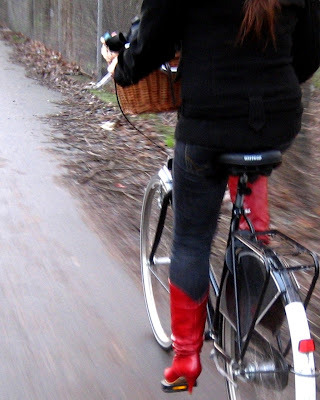 Cycle Chic is a trademark of Cycle Chic/Copenhagenize, Frederiksberg, Denmark.